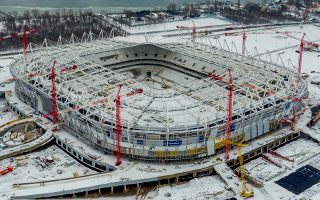 Russia 2018: Rostov Arena to be done ahead of schedule? Over the past year progress at Rostov Arena maybe wasn’t too visible, but that’s because bulk of the stadium’s main concrete structure was created by early 2016. Back in April the concrete structure’s progress rate was estimated at 70%, now that’s the progress for all of Rostov Arena. The most advanced part are brickworks (90%), while non-brick masonry work is 85% advanced. The prefabricated steps of future stands are 78% ready, leaving a fifth of the seating bowl yet to be delivered. The roof membrane is in place over one corner of the stadium, but installation had to be halted due low temperatures. It’s expected to restart again in early April. The membrane is supplied by Serge Ferrari, company known for sailing membranes, but also several major stadium projects. Inside the stadium plastering and installation (electrical, heating, water and sewage) are estimated to be 60% delivered. 19,300 m2 of façade mesh is yet to be mounted into place. We also know the seating colours to be used. Rostov Arena will offer blue, red, yellow and white seats. Blue and yellow represent FC Rostov, while blue and red are the colours of the Rostov Region. With 10 months of challenging work still ahead, the Rostov authorities are very optimistic. Governor Vasily Golubev announced recently that he hopes all work will be done in November instead of December 25, which would be roughly a month ahead of schedule. Rostov Arena will accommodate 45,000 people. The stadium should be built under 20 billion rubles, or $330 million.